Ferdinand I (Spanish: Fernando I) (10 March 1503 – 25 July 1564) was Holy Roman Emperor from 1558, king of Bohemia and Hungary from 1526, and king of Croatia from 1527 until his death. 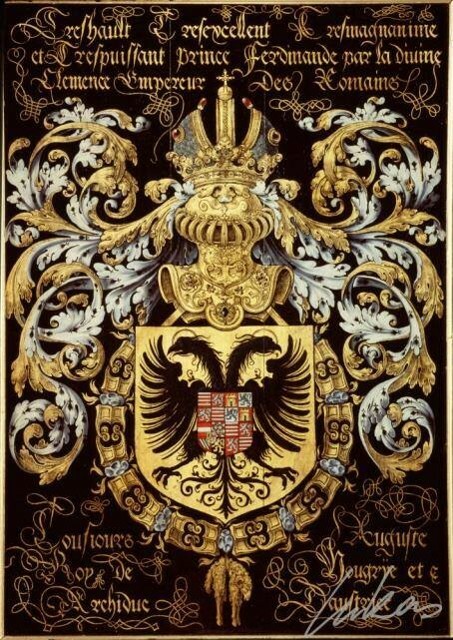 Before his accession, he ruled the Austrian hereditary lands of the Habsburgs in the name of his elder brother, Charles V, Holy Roman Emperor. Also, he often served as Charles' representative in Germany and developed useful relationships with German princes. The key events during his reign were the contest with the Ottoman Empire, whose great advance into Central Europe began in the 1520s, and the Protestant Reformation, which resulted in several wars of religion. Ferdinand was able to defend his realm and make it somewhat more cohesive, but he could not conquer the major part of Hungary. His flexible approach to Imperial problems, mainly religious, finally brought more result than the more confrontational attitude of his brother. Ferdinand's motto was Fiat iustitia, et pereat mundus: "Let justice be done, though the world perish". 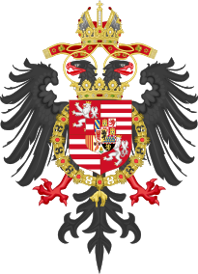 Ferdinand was born in Alcalá de Henares, Spain, the son of the Trastámara Princess Joanna ("Joanna the Mad"), and Habsburg Archduke Philip the Handsome, who was heir to Maximilian I, Holy Roman Emperor. Ferdinand shared his customs, culture, and even his birthday with his maternal grandfather Ferdinand II of Aragon. He was born, raised, and educated in Spain, and did not learn German when he was young. In the summer of 1518 Ferdinand was sent to Flanders following his brother Charles's arrival in Spain as newly appointed King Charles I the previous autumn. He returned in command of his brother's fleet but en route was blown off-course and spent four days in Kinsale in Ireland before reaching his destination. With the death of his grandfather Maximilian I and the accession of his now 19-year-old brother, Charles V, to title of Holy Roman Emperor in 1519, Ferdinand was entrusted with the government of the Austrian hereditary lands, roughly modern-day Austria and Slovenia. He was Archduke of Austria from 1521 to 1564. Though he supported his brother, Ferdinand also managed to strengthen his own realm. By adopting the German language and culture late in his life, he also grew close to the German territorial princes. After the death of his brother-in-law Louis II, Ferdinand ruled as King of Bohemia and Hungary (1526–1564). Ferdinand also served as his brother's deputy in the Holy Roman Empire during his brother's many absences, and in 1531 was elected King of the Romans, making him Charles's designated heir in the empire. Charles retired in 1556 and Ferdinand adopted the title "Emperor elect" in 1558, while Spain, the Spanish Empire, Naples, Sicily, Milan, the Netherlands, and Franche-Comté went to Philip, son of Charles. According to the terms set at the First Congress of Vienna in 1515, Ferdinand married Anne Jagiellonica, daughter of King Vladislaus II of Bohemia and Hungary on 22 July 1515. Therefore, after the death of his brother-in-law Louis II, King of Bohemia and of Hungary, at the battle of Mohács on 29 August 1526, Ferdinand inherited both kingdoms. On 24 October 1526 the Bohemian Diet, acting under the influence of chancellor Adam of Hradce, elected Ferdinand King of Bohemia under conditions of confirming traditional privileges of the estates and also moving the Habsburg court to Prague. The success was only partial, as the Diet refused to recognise Ferdinand as hereditary lord of the Kingdom. The Croatian nobles unanimously elected Ferdinand I as their king in the 1527 election in Cetin, and confirmed the succession to him and his heirs. In return for the throne, Archduke Ferdinand promised to respect the historic rights, freedoms, laws and customs of the Croats when they united with the Hungarian kingdom and to defend Croatia from Ottoman invasion. 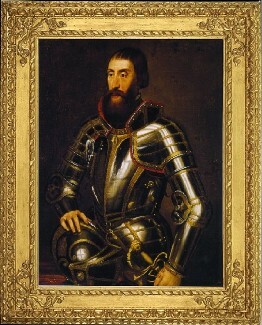 In Hungary, Nicolaus Olahus, secretary of Louis, attached himself to the party of Ferdinand but retained his position with his sister, Queen Dowager Mary. Ferdinand was elected King of Hungary by a rump Diet in Pozsony in December 1526. The throne of Hungary became the subject of a dynastic dispute between Ferdinand and John Zápolya, Voivode of Transylvania. They were supported by different factions of the nobility in the Hungarian kingdom. Ferdinand also had the support of his brother, the Emperor Charles V. Ferdinand defeated Zápolya at the Battle of Tarcal in September 1527 and again in the Battle of Szina in March 1528. Zápolya fled the country and applied to Sultan Suleiman the Magnificent for support, making Hungary an Ottoman vassal state. This led to the most dangerous moment of Ferdinand's career, in 1529, when Suleiman took advantage of this Hungarian support for a massive but ultimately unsuccessful assault on Ferdinand's capital: the Siege of Vienna, which sent Ferdinand to refuge in Bohemia. A further Ottoman invasion was repelled in 1533. In that year Ferdinand made peace with the Ottomans, splitting Hungary into a Habsburg sector in the west and John Zápolya's domain in the east, the latter effectively a vassal state of the Ottoman Empire. Suleiman had allocated Transylvania and eastern Royal Hungary to John II Sigismund, which became the "Eastern Hungarian Kingdom", reigned over by his mother, Isabella Jagie? ?o, with Martinuzzi as the real power. But Isabella's hostile intrigues and threats from the Ottomans led Martinuzzi to switch round. In 1549, he agreed to support Ferdinand's claim, and Imperial armies marched into Transylvania. In the Treaty of Weissenburg (1551), Isabella agreed on behalf of John II Sigismund to abdicate as King of Hungary and to hand over the royal crown and regalia. Thus Royal Hungary and Transylvania went to Ferdinand, who agreed to recognise John II Sigismund as vassal Prince of Transylvania and betrothed one of his daughters to him. Meanwhile, Martinuzzi attempted to keep the Ottomans happy even after they responded by sending troops. Ferdinand's general Castaldo suspected Martinuzzi of treason and with Ferdinand's approval had him killed. When he took control of the Bohemian land in the 1520s, their religious situation was complex. Its German population was composed of Catholics and Lutherans. Some Czechs were receptive to Lutheranism, but most of them adhered to Utraquism. A significant number of utraquists favoured an alliance with the Protestants. At first, Ferdinand accepted this situation and he gave considerable freedom to the Bohemian estates. In the 1540s, the situation changed. In Germany, while most Protestant princes had hitherto favored negotiation with the Emperor and while many had actually supported him in his wars, they became increasingly confrontational during this decade. Some of them even went to war against the Empire, and many Bohemian (German or Czech) Protestants or utraquists sympathized with them. In 1547 the Bohemian Estates rebelled against Ferdinand after he had ordered the Bohemian army to move against the German Protestants. After suppressing the revolt, he retaliated by limiting the privileges of Bohemian cities and inserting a new bureaucracy of royal officials to control urban authorities. Ferdinand was a supporter of the Counter-Reformation and helped lead the Catholic response against what he saw as the heretical tide of Protestantism. For example, in 1551 he invited the Jesuits to Vienna and in 1556 to Prague. Finally, in 1561 Ferdinand revived the Archdiocese of Prague, which had been previously liquidated due to the success of the Protestants. Ferdinand died in Vienna and is buried in St. Vitus Cathedral in Prague.